My first interaction with The Ulman Cancer Fund (UCF) was not as a survivor but as a supporter. I found out about UCF when I signed up for its inaugural Half Full Triathlon in 2010. After watching my dad go through cancer the year before I leapt at any opportunity to raise money and awareness for those battling this awful disease. UCF was a great organization to support at that time; it put its money into programs that directly impact cancer patients, survivors and their families, what more could I ask for? Fast-forward about 6 months, to March of 2011. 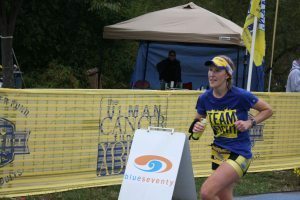 I, Katie Anderson, 28-year-old triathlete and marathon runner was diagnosed with breast cancer. Getting diagnosed with cancer at such a young age was terrifying, isolating and mind-boggling. I had no idea that you could get breast cancer that young, especially when I felt like I was doing everything I could to live a healthy life. 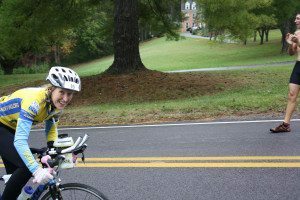 After the initial fear, turmoil and distress subsided, I thought back to that amazing triathlon, Half Full, that I participated in 6 months prior, where I competed alongside cancer survivors. Survivor, I thought, that was going to be me. I was going to beat this deadly disease and get back out there. From that point forward, I began to look at my journey half full. While the road was tough and painful, both emotionally and physically, I did just that. Despite facing a mastectomy and several other surgeries, I set my mind on participating in Half Full again, so that I could raise money and awareness for those battling cancer. Competing in a race dedicated to cancer patients, survivors and families gave me something to work towards, something to look forward to. Despite my multiple surgeries, I did it. I got back out there and competed in Half Full in 2012. After this race, and learning more about how UCF supports young cancer patients like myself and their families through programs like Cancer to 5K and patient navigators, I jumped full force into UCF activities and haven’t looked back since. In the past year, I have started volunteering with Cancer to 5K and have also joined Team Fight. Both of these programs have led me to other cancer survivors, which is a great support to me as a 30-year-old who still faces fears of recurrence and daily aches and pains. These programs also allow me to combine my passion for competing in endurance races and my need to give back to the cancer community. I hope that you too will decide to give back to the cancer community and support a great organization that supports so many young cancer patients, survivors and their families. As a survivor, The Ulman Cancer Fund has given me a support group to lean on and raise awareness with. Join me in this great fight!